With the speed of today’s 24/7 news cycle, public employers are tasked with effectively responding to a dizzying number of issues unique to them and claims brought by their employees. That’s why we literally ripped some of these stories from recent headlines to formulate a webinar designed to help public employers stay ahead of such issues as retaliation claims, employee opioid addiction, guns in the workplace and more. 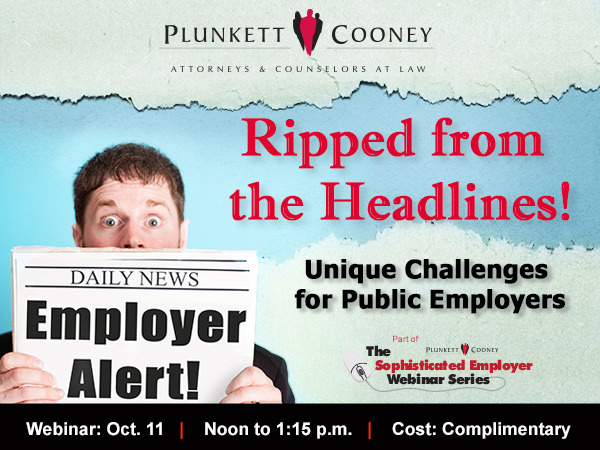 Hosted by the members of Plunkett Cooney’s Labor & Employment Law Practice Group, this complimentary webinar explored the protections public employers do and do not have under the Constitution to effectively and legally manage their workforce. This webinar was designed to benefit executives and human resources professionals in the public sector. This activity was approved by the HR Certification Institute for 1.25 (general) recertification credits toward the aPHR®, PHR®, PHRca®, SPHR®, GPHR®, PHRi® and SPHRi® certifications. The use of this seal confirms that this activity has met HR Certification Institute’s® (HRCI®) criteria for recertification credit pre-approval. This approval is valid through 10/11/2018 and is not transferable. Plunkett Cooney is recognized by SHRM to offer Professional Development Credits (PDCs) for the SHRM-CPSM or SHRM-SCPSM. This program was valid for 1.25 PDCs for the SHRM-CPSM or SHRM-SCPSM.For more information about certification or recertification, please visit www.shrmcertification.org. The managing partner of the firm's Flint, Michigan office, Audrey J. Forbush serves as a member of Plunkett Cooney's Board of Directors and as Co-Leader of the Governmental Law Practice Group. Ms. Forbush focuses her trial practice primarily in the area of municipal liability with particular expertise in police liability issues, such as search and seizure, use of force, pursuits and correctional law; civil rights; whistleblower; labor and employment (discipline, wrongful discharge and contract related issues), zoning and personal injury. She also advises public and private universities with respect to Title IX claims of alleged sexual assaults on campus. Ridley S. Nimmo, II is a member of Plunkett Cooney’s Flint office and is a partner in the firm’s Litigation, Title and Municipal Law practice groups. His practice is focused in the areas of civil litigation, municipal law, real property law, employment litigation, consumer litigation, construction liability and professional liability. Mr. Nimmo represents major corporations and retailers in litigation matters throughout the State of Michigan. He has an extensive experience handling matters involving adverse possession; commercial litigation; constitutional law; construction litigation; consumer litigation; dram shop litigation; employment law and discrimination claims; equine law; governmental immunity; motor vehicle liability; premises liability; product liability; professional liability; real property law; takings claims and zoning law. With over 25 years of experience in employment law, Laura M. Dinon concentrates her practice on representing public and private employers in all aspects of employment law, including labor relations. She has a broad client base of small to medium size businesses, including healthcare practices, municipalities and large insurance companies. She handles cases in federal and state courts, as well as arbitrations and administrative agency hearings.